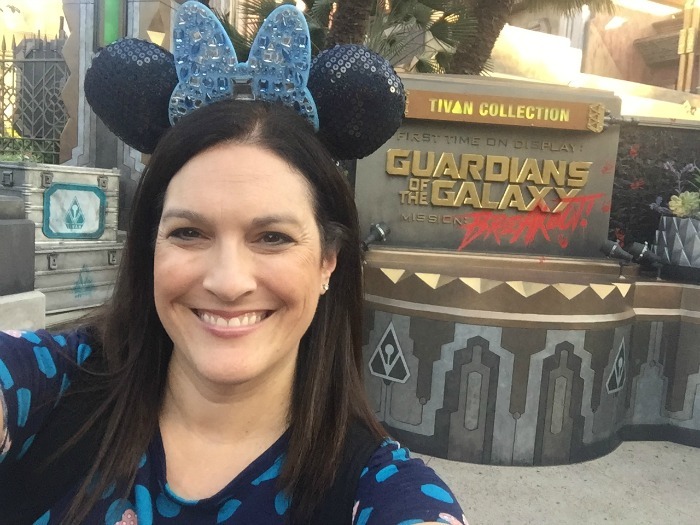 Disclaimer: Disney invited me to California on an all-expenses paid trip, in exchange for my coverage of events, which included D23 Expo and a visit to Disneyland Summer of Heroes and a ride on Guardians of the Galaxy: Mission Breakout (if I so dared)! As always, all opinions are my own. 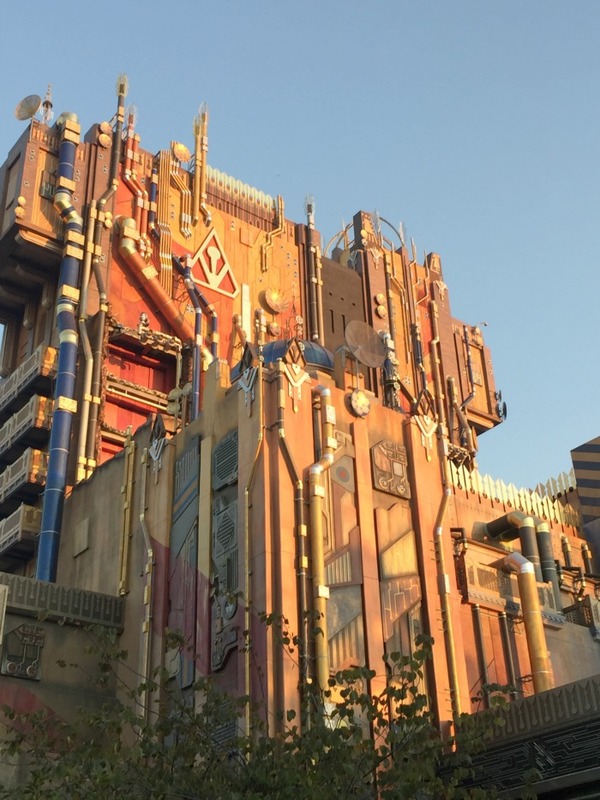 If a trip to Disneyland is in your near future (or if you are just daydreaming about one), you’ll want to know all the scoop about Guardians of the Galaxy: Mission Breakout!, the newest attraction at California Adventure. Let’s not forget all the extra superhero fun during this Summer of Heroes! California Adventure (Disney’s theme park just steps away from the original Disneyland park) is where the Summer of Heroes is happening. 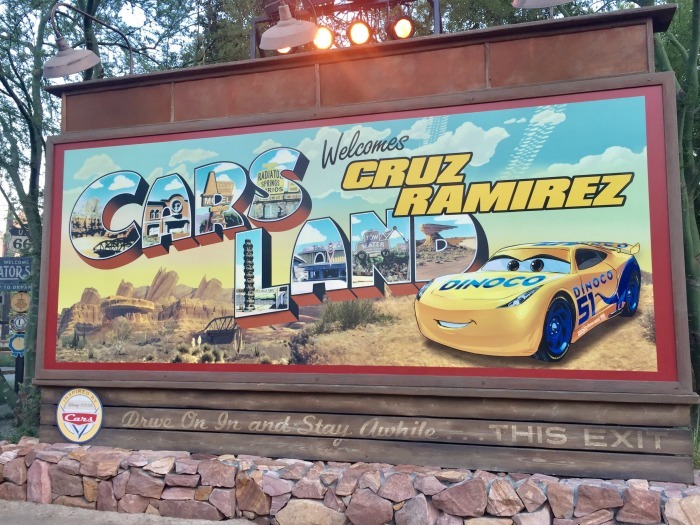 Both parks have special things going on this summer (and in the future…you did see all the Disney Parks announcements from D23 Expo, right?) More on these below. You might be asking yourself why the focus on superheroes right now? Well, Disney is Marvel. Marvel is Disney. So it was just a matter of time before we started seeing more Marvel in our theme parks and hotels. What? A Marvel themed hotel? Yes…click to read more! 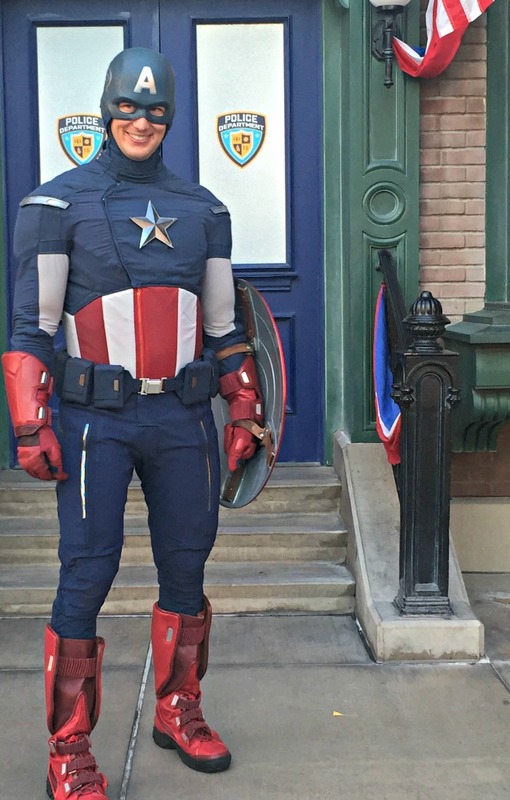 While we’ve seen superheroes slowly introduced to Disney Parks, especially with meet and greet photo opportunities, this summer has kicked things off bigger and better than ever with Summer of Heroes. You can meet even more superheroes and interact with them in entirely new ways! Train and perfect your skills with Black Widow and Hawkeye at the Avengers Training Initiative. Yes, completely interactive with kids selected to go on stage. 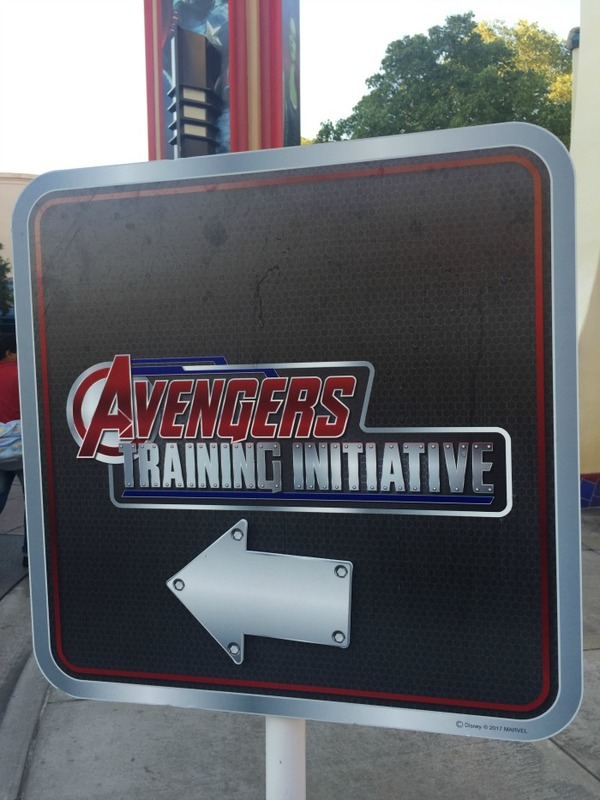 Want to get your child selected for the Avengers Training Initiative? This opportunity to go on stage is for kids ages 6 through 12. Head to the kiosk in the Hollywood Backlot near Stage 17 and Sunset Showcase Theater and sign up. Advanced registration is required for this opportunity (much like the Jedi Training), and registration begins as soon as the park opens, so head there first. Park opening includes any Extra Magic Hours. Seriously, to be a Avengers trainee would be a highlight of a kids’ vacation! You’ll want to head to the Hero Action Center within Hollywood Land (in a kiosk type area) to find out just which superhero you are most like. TASK: Take a computer-generated quiz (parents might need to help little ones who can’t read yet), and discover the superhero you share a mark with. For me, it was Spider-Man! The mark, responsibility! Like Spider-Man, you understand the duty that your power entails. You’re calm under pressure – disarming your foes with wit and humor. Your never-ending curiosity and thirst for excitement draws you to city life. A perfect afternoon for you involves a stroll around your friendly neighborhood, capturing photographs and helping others. Honesty, integrity, and strong judgment make you the perfect choice for the mark of …Responsibility! Pretty cool activity that will have your kids talking (hey, adults too)! As you leave, you will be handed a sticker of your mark and a comic book filled with comics and more details on the superheroes we all love and how you can choose activities in your life to reflect the mark that was given to you. I was smiling, but did I go on this ride? I had a FastPass for the ride, but I’ll admit I was a bit nervous and kept changing my mind. Why? Well, Tower of Terror (the previous attraction at this spot, and still in Orlando) was never my favorite ride. I was “one and done”. I love a great rollercoaster but there was something about going up and down in an elevator (falling), that I didn’t care for. But NOW it was themed Guardians of the Galaxy. Same basic ride (housed in the same place after all), but the theme-ing would no doubt be incredible. I wasn’t sure I would go on the ride, but I knew I would walk through the queue in order to see everything. 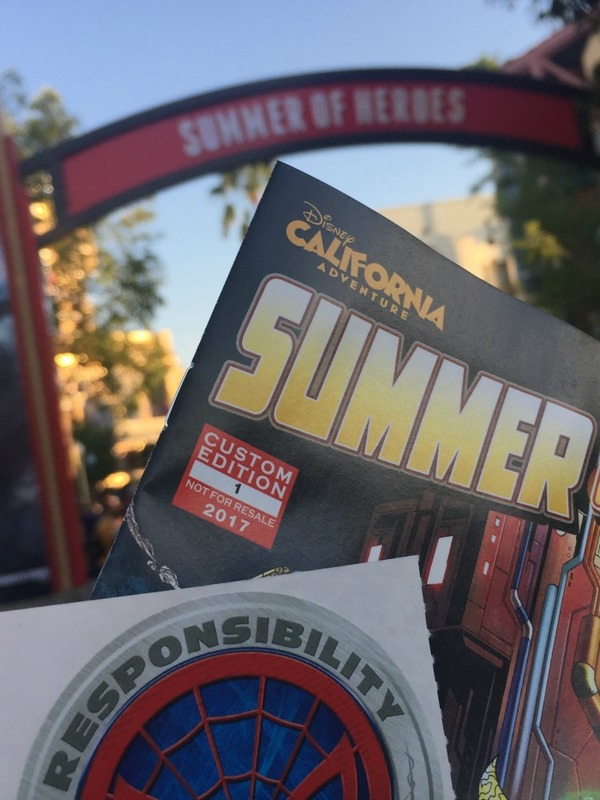 California Adventure is the only Disney park in the universe where guests can step into a Guardians of the Galaxy story…for now! I say “for now” because maybe you heard the crowds scream with delight when a new Guardians of the Galaxy attraction was announced at D23 Expo! I approached the 183-foot tall fortress and walked inside. You’ll be met at the entrance to the door by an eight-foot-tall statue of The Collector. We are here to view the unique “Tivan Collection” of relics and species from all over the universe. The Collector’s latest acquisition just happens to be our favorite friends, the Guardians of the Galaxy. Inside the lobby area (just a little bit creepy), you spy display cases that hold artifacts and living creatures. In a welcome video, The Collector explains how he has trapped the Guardians of the Galaxy high atop his fortress in secured glass cages that are wired with power from a massive generator and suspended over a deep abyss. As we prepared to leave the lobby and enter The Collector’s Office, we had to hold up our hands to be “bio-scanned” for security clearance. The office reveals more relics on display. TIP: Be on the lookout, as the collection contains some hidden references that will delight dedicated Super Hero fans and Disney fans. 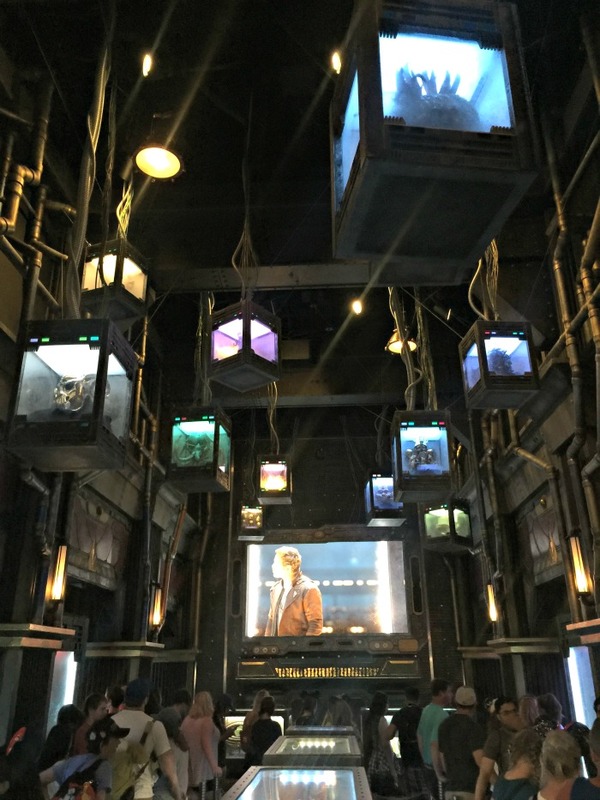 After guests enter the gantry lift, Rocket overrides The Collector’s recorded tour spiel with music from the tape player of Star-Lord (aka Peter Quill). Soon, the gantry is shooting up into the fortress, then plummeting downward as Rocket attempts to take control of the generator. 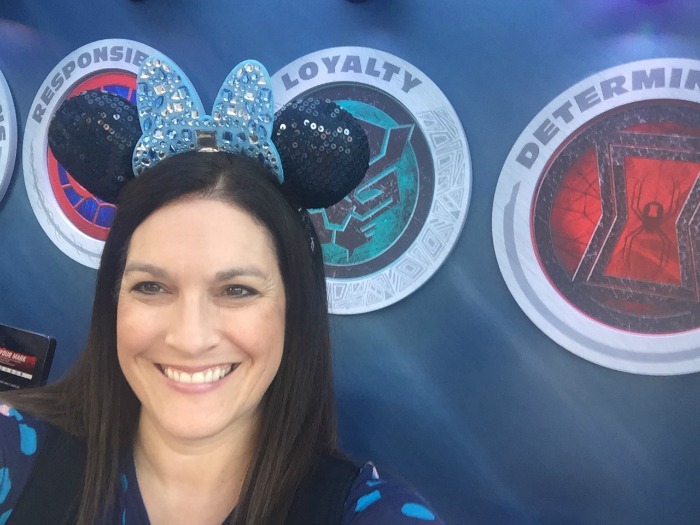 Did I go on Guardians of the Galaxy: Mission Breakout!? Yikes – I sure did! I wasn’t going to, but at the VERY last minute (despite my sweaty palms and pounding heart), I went inside the gantry lift. It was as I remembered…SCARY thrilling to go up and down. My ride profile was “Hit Me With Your Best Shot” by Pat Benatar, and though my eyes were open the entire time, I don’t think I heard a word of that song. I held on for dear life as the lift plummeted up and down, but I did enjoy seeing my favorite Guardians during the ride. No trip to a Disney Park is complete without a stop for a treat or two. Summer of Heroes definitely raised the bar with some incredible new options, so if you haven’t been lately, what are you waiting for? 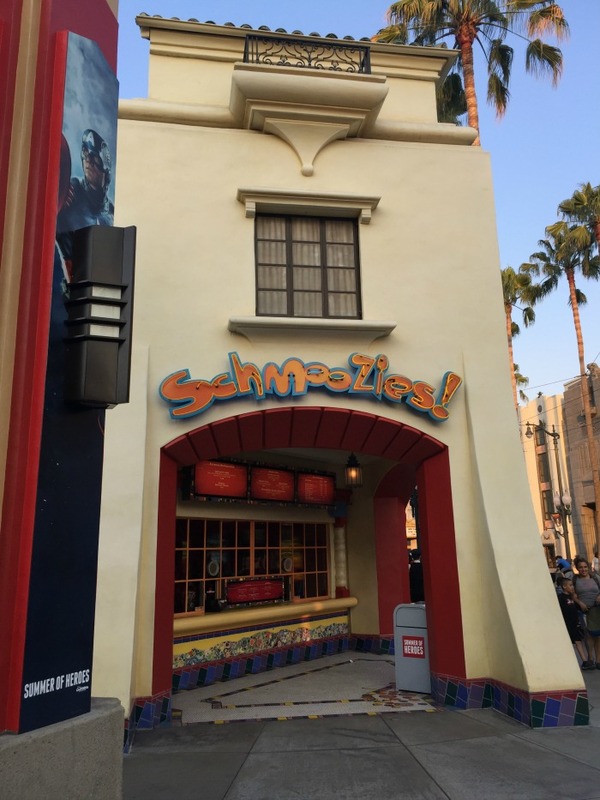 Superhero inspired food and beverages are found at six different locations within Hollywood Land. 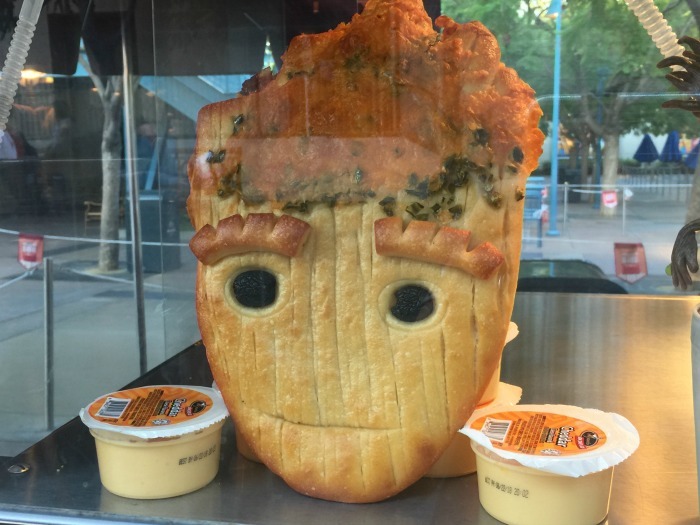 The cutest by far was the Groot-shaped bread, apparently available in both sourdough and jalapeno-cheddar flavors, though we could only find the jalapeno-cheddar one. Since I’m not too “spicy” of a girl, I passed on that. Cuteness factor is off the charts! The Most Dangerous Tacos in the Galaxy, inspired by the fiery personality of Gamora, feature barbacoa, green onion slaw and habanero salsa. Dessert, perhaps my favorite meal of the day, was extra special at the park. One dessert is inspired by baby Groot. The Angry Little Pudding Cup features chocolate pudding with crumbled chocolate sandwich cookie, whipped cream and funnel cake fries. I’ll be honest, for weeks I had my eyes set on enjoying the Spider-Man Gamma Sized Donut. Sadly, I soon realized that they only sell these in the mornings (and with our packed D23 Expo schedule, we could only visit the park in the evenings). And they do sell out quickly! So, with a broken heart, I tried to find something else worthy. And I did! 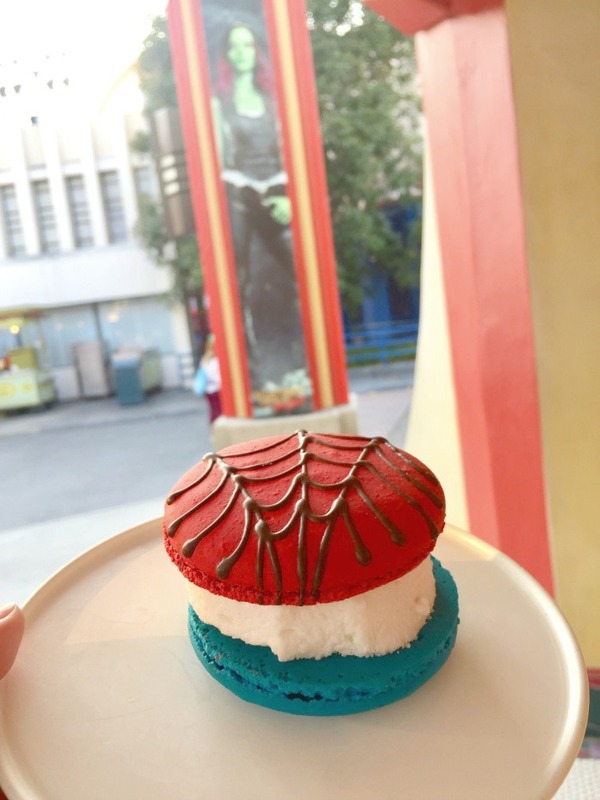 At Schmoozies, where the donuts are sold, I spotted this Spider-Man macaron ice cream sandwich! Seriously delicious. TIP: Go to Schmoozies first thing in the morning for the superhero themed Gamma-Sized Donuts! 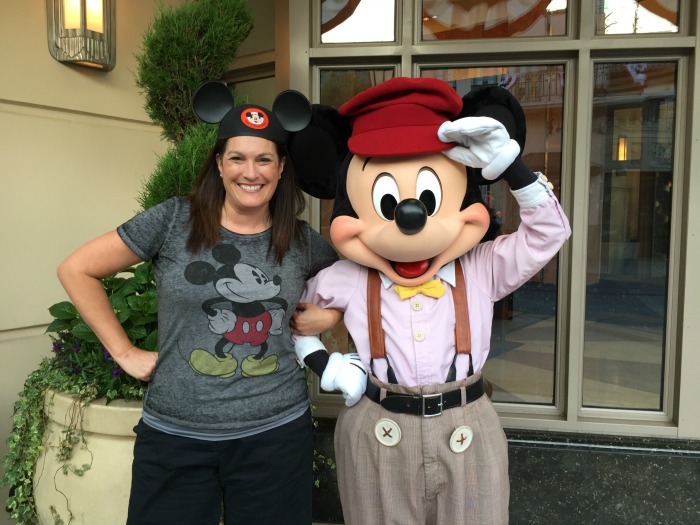 I told you earlier that there is more fun to be had at Disneyland and California Adventure! New “Disney Junior Dance Party! Iconic Disneyland Railroad and the Rivers of America attractions return to Disneyland park this summer. For the first time ever, the Disneyland Railroad will be making a left-hand turn as it circles the park. Special summer food – you’ll spy special signage on the windows (not on main sign). A few I spotted at California Adventure…(Bacon Mac & Cheese Cone at Cozy Cone Motel, Carsland); (Red, Yellow, or Blue Racing Stripe Churros at Cozy Cone Motel, Carsland); (Cool Dinoco Blue Shake at Flo’s V8 Cafe, Carsland); At Disneyland…(Lost Treasure Beignets – Lemon-flavored beignets with gold shimmer dust), Mint Julep Bar walk-up counter next to French Market restaurant, New Orleans Square). TIP: Don’t forget to stay at a Disney resort hotel, like the original Disneyland Hotel, to get access to the parks early (Extra Magic Hours)! I’m Going to D23 Expo – I’m in Disney costume for this! Now I am scrolling through Instagram trying to find a picture of that Baby Groot dessert! There is SO MUCH going on at Disneyland! I can’t wait for my next trip! Well, you definitely can walk though the entire thing with them and just not get on (that had been my plan)! LOL You will enjoy the walk through so much!